Because Veetie had to drop from this year's Blind Date event (because health; and I honestly am not fussed because I had to drop out of my second Secret Santa ever), I was supposed to end up with a Super Blind Date. However, because my wishlist is patently ridiculous (I know, I know, but my theme is SO SPECIFIC that I like to give people who maybe aren't used to the Middle Ages a lot of options), Shasta instead asked literally everyone who had volunteered as a Super Blind Date if they could make me one little thing, instead of swooping in with a full pinch-hitting. Everyone said yes, and I'm still kinda gobsmacked about it. You can find the gifts here. The last gift I got was from ElfPuddle, who tried very hard to figure out how to default clothing, a new skill for them. ElfPuddle didn't quite make it, but sent me all the bits they'd gathered-- and I do know how to default clothes and hair (I just don't have the time to make literally everything I want for my game, more's the pity). So ElfPuddle sent everything they got done, I did a little bit more and then discovered I don't know how to do defaults with LESS groups than the originals, but maybe somebody else knows what they're doing. On the other hand... 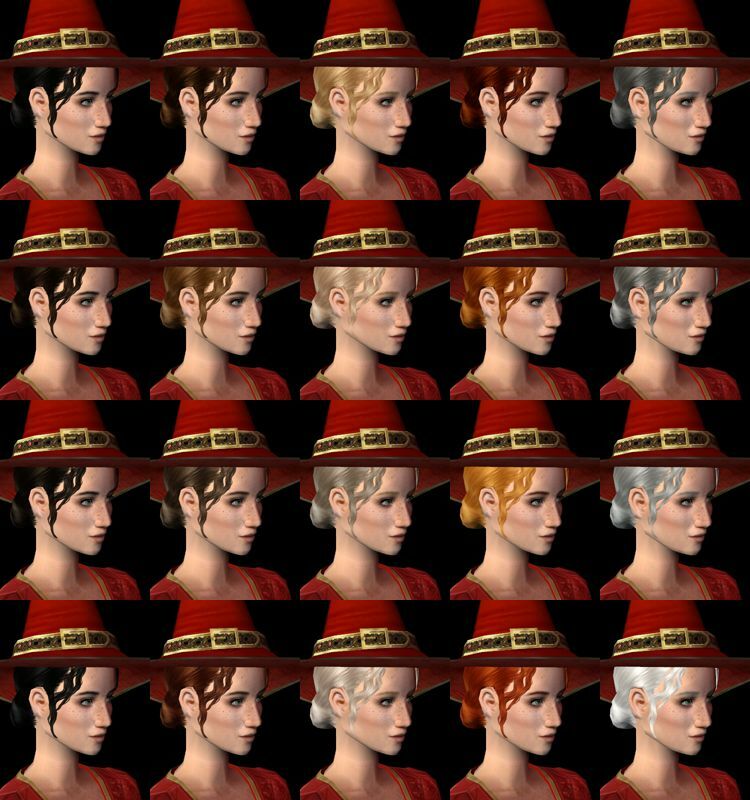 I got some recolors done? 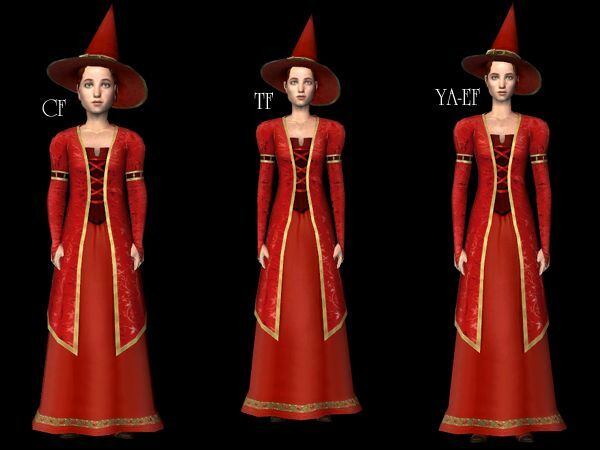 So what you have above is K8's Fairy Witch gown (2,334 polys, with AF pregmorph and TF & CF conversions by Cynnix) and Trapping's All-Ages AL Witch Hat (1,265 polys, probably requires Apartment Life) in Neder's Neutral Red Mage colors, tweaked by ElfPuddle and tweaked some more by me (I fiddled with a sleeve and some laces and made the stomacher burgundy to help break up the red). 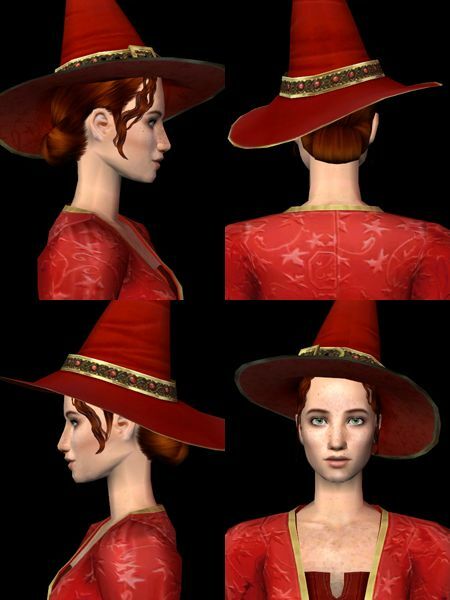 I've included what should be an extracted mesh so you can use the witch hat if you don't have Apartment life installed, but I can't check it. But we failed at defaulting, Elfpuddle and I, so instead it's just a nice stand-alone gown-and-hat set. Gowns are available for casual, maternity, outerwear, and formal. 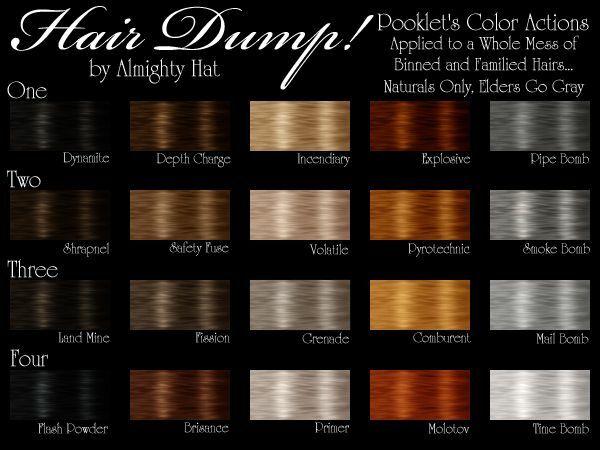 Hats come binned my usual way, with a gray for each color because it's easier for downloaders to remove one rather than add one if they want to re-bin (go ahead and re-bin, Shrapnel makes a nice brown and both Safety Fuse and Comburent could pass as blonds, you do you). Not compressorized because I forgot. I've been meaning to get this one up for a while now, and what better time than while I'm waiting to see if my Blind Date will share their goodies? For some time now, my ladies have had perfectly serviceable scanties, and that's just wonderful. However, whenever you're playing any kind of themed game, things like Elder Male Swimwear tends to get the short end of the stick. A companion piece to my last post full of chausses, but where that one was knee-high hosen, gartered for ladies, this one is full-leg. So I've had some ladies' separates done for ages, and I've always meant to do the men's stuff, too... but I kept putting it off, because I felt like I needed to get all the foundation pieces together-- enough pieces that, if you watch your colors, your Sims can just sort of go through and strip. I finally got to that point, so I finally got to make some menswear! In a continuing effort to back up my Garden of Shadows exclusives to Dreamwidth, without just duplicating the original posts where they're actually MEANT to be exclusive, here are the goodies that got heraldry of one sort or another. I am an utter nut for heraldry, and when I got invited to participate in the first Garden of Shadows advent back in 2010, somehow my brain decided heraldic stuff was entirely logical. GoS already had a perfectly cromulent color scheme (that blue is azure in Medieval heraldry (when all blues were azure), but bleu celeste later on), and plenty of charges to choose from... but you'd be amazed how hard it is to find decent line-drawings of baby geese suitable for silly heraldic purposes. Alfred Askew drew the gosling. Alfi rocks. Okay, let's get to the goodies. Wide-Laced Kirtles with Contrast Plackets as Separates! Oh MAN I've been wanting to do this one for ages! Luckily, the longer I waited, the better the available meshes got. Patience is a virtue, AND I knew exactly how I wanted to tackle the textures by the time I got around to actually, you know, making them. It says 'part three' (okay it says it in French), but this is actually something of a new beginning as chausses, hosen, and stockings go. For I have not simply done twenty colors, no! I really wanted to get more done for this month's GoS challenge, but between briefly coming down sick (I'm okay! ), some interpersonal drama, and hitting a major snag with a good 50% of what I WANTED to upload this month... Well, I'm squeaking in under the wire and the stuff I couldn't finish will have to come later. Without further ado, the stuff that got done! On this fine Feast of Fools, I'm going to start off with the big one-- the Front-Laced Lady. I'm just gonna use the original title card because this is a small but epic update. SO MANY THINGS needed pictures taken that this is the prettiest picture you get for this post. Please do enjoy it. I'm gonna come right out and say it, I don't feel like these are my very best work. I was proud of them when I did them, and I'll probably use them, at least until I get around to making something better, but you've got to start somewhere, right? So, some time ago, I put up some much-needed Medieval men's underwear, which you can find right here. And I was really happy with it! I still am, in fact, it's just that there have been some new meshes done, plus some conversions of some meshes, and in general it was just time to expand the chausseur's stock. There is never enough Medieval underwear... okay, for anyone, but especially for males... especially-especially for children and elders. It's not that nobody knows what they wore (even if most people assume they wore thin, stretchy joined tights, like pantyhose), but I think it's considered too easy, not challenging enough. Well, I never met a challenge that was too easy!